Founded in 2017 as the Wellborn Hub, the Upper Valley Teaching Place Collaborative (UVTPC) is a network of education professional development providers and practitioners who work together to advance high-quality place-based and ecological education in all Upper Valley Schools. We envision an Upper Valley where all students are deeply engaged in education that fosters ecological understanding and connection to place. The UVTPC is supported by the New Hampshire Charitable Foundation’s Wellborn Ecology Fund. 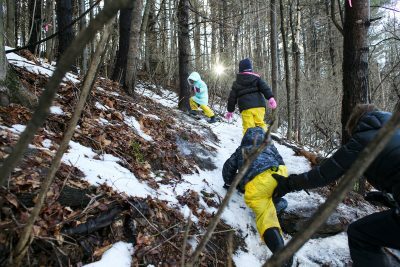 Since its inception in 2001, the Wellborn Ecology Fund has awarded grants totaling more than $5.5 million to more than 125 organizations and programs in the Upper Valley. Monthly newsletters with stories of local PBEE practitioners, events, training opportunities, and grant listings. This website designed to provide you easy access to PBEE resources and networking opportunities. The UVTPC is a diverse and committed network. We have several Working Groups that lead our work. Emily Shipman serves as the Wellborn Hub coordinator.